I became aware of The Shires when Bob Harris first played ‘Nashville Grey Skies’ on BBC Radio 2, which seems like such a long long time ago. It became apparent from the moment it hit the chorus that these guys had something special, and I remember the excitement I felt about a brand new British country act gaining exposure on a nation-wide radio station. This was at a time when C2C was not the enormous, globally recognised festival it is today, and country music was still very much a niche market in the UK. To hear such a talented home-grown country duo producing a brilliant track like ‘Nashville Grey Skies’ was hugely exciting for me, and it was clear that Ben and Crissie had the ability to be up there with the best in the genre. Since then, The Shires have shot to success both nationally and internationally. 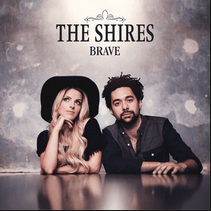 Their stunning debut album ‘Brave’ made them the first British country act to chart in the top 10 of the UK albums chart, and the album continues to perform well in the iTunes chart thanks to appearances on shows such as The One Show and The Graham Norton Show. They have also had the opportunity to perform at the home of country music, the Grand Ole Opry in Nashville, and soon they will be travelling back to America to open for Little Big Town on six dates of their ‘Painkiller’ tour, before returning to the UK to open for The Corrs on their nation-wide arena tour. On 18 October I was fortunate enough to see The Shires for a fourth time, this time at The Institute in Birmingham. Every time I go and watch Ben and Crissie, I feel immensely proud to have watched their fan base expand, as they have played at bigger venues each and every time. It was great to see some familiar UK country fans in the crowd, as well as a large proportion who were solely fans of The Shires, a great demonstration of how their music is introducing our genre to a mass audience. The show began with a superb 20-minute set from Darline, a female country-pop duo who I admittedly had not heard much about before the gig. They were an ideal act to open for The Shires, as their mainstream-orientated style of country really got the crowd going, and I was hugely impressed by the quality and clarity of their vocals. Their set also displayed their wonderful song-writing skills, ‘Summertime’ in particular which featured an incredibly catchy chorus that got many in the crowd singing along. I would describe Darline as the British Maddie and Tae – they are incredibly talented and certainly have a lot of potential. Darline’s set was followed by a 30-minute set by Jonathan Jeremiah, an artist who came to my attention when his single ‘Happiness’ was added to the BBC Radio 2 playlist some time ago. Although Jonathan isn’t particularly a country artist, the quality of his music and lyrics was appreciated by the audience throughout, and it was no surprise as to why he has had the success he has. I would liken his style to Michael Kiwanuka (an artist I would urge anyone to listen to) and the crowd seemed to thoroughly enjoy the range of tracks he performed. I came away desperate to hear more of Jonathan’s music, and I’m sure many others did too. Soon after, The Shires took to the stage with ‘All Over Again’, a superb way to start the set as Ben and Crissie gave the audience the opportunity to sing along during the chorus, bringing everyone together and creating an energetic atmosphere. As usual, Ben and Crissie’s vocals were absolutely superb. This was followed by their first single ‘Nashville Grey Skies’ which had a similar impact, kicking off the show in spectacular fashion. I also must give a mention to the incredible band, who demonstrated their immense ability throughout the show, sounding as brilliant as ever. Whether they were rocking The Institute with ‘Jekyll and Hyde’ or slowing it down for ‘Brave’, their talent cannot be denied and they truly allow the songs to come to life during the live shows. A personal highlight was around half way through the set, when the band got together at the front of the stage to perform a few songs acoustically. Ben explained that during their trip to Nashville, they experienced a tradition called the ‘songwriter’s circle’, where songwriters come together to perform tracks they have written earlier in the day. The Shires wanted to re-create this, and it made for a very memorable 15 minutes, showcasing the raw quality of the whole band as well as Ben and Crissie’s superb song writing abilities. We were treated to a wonderful performance of ‘Same’, my personal favourite from their first release, ‘The Green Note EP’. This was followed by a brand new track named ‘Other People’s Things’, a slow track they wrote with Nina Nesbitt, and I sincerely hope this will be featured on the second album as it is a truly stunning track which gave me goose bumps. As I left the venue, I heard a number of people mention the track saying how beautiful it was – trust me, this has the potential to be a HUGE hit. We were also treated to a track called ‘Drive’ (a short video can be found on our Twitter page @LifeInASong_UK), which Ben and Crissie wrote with Kip Moore after his performance at C2C in London earlier this year. As a huge Kip Moore fan myself, I was delighted to hear this, and it was the perfect blend of Kip’s catchy lyrics with the melodic beauty we have come to expect from The Shires. This is definitely one to look out for – no doubt we will hear a studio version of the track soon. Almost every track on the album was performed during the show, even one of the gorgeous bonus tracks ‘Only Midnight’ (video can be found below), and the crowd knew every word. As someone who saw them at the Glee Club a while back, performing in front of around 100 people, this was an incredible thing to witness. Needless to say, it also demonstrates the quality of the album – there certainly aren’t any tracks that fans want to skip. The show was brought to an end with ‘Tonight’, another great opportunity for crowd participation. Anybody who has seen The Shires live will be familiar with the ‘splitting the crowd in half’ section of this track, where Ben and Crissie encourage both sides to sing a line of the song, and it really is something to witness. They seemed genuinely blown away by the response of the Birmingham crowd. When they left the stage, the crowd carried on singing ‘Tonight’, so soon after they returned to perform a wonderful cover of ‘Islands In The Stream’ as an encore. To anybody who hasn’t yet seen The Shires live, I would urge you to buy a ticket – you won’t be disappointed. This was my fourth show, and they never fail to blow me away with their incredible vocals, harmonies and superb repertoire. I cannot wait to see how their music continues to grow, and I am sure we are still at the beginning of their success. There is certainly much more to come from The Shires.